AOI BIJYUTSU SYOSIN KANTEISYO. NBTHKTokubetsu Hozon Token. Blade length :　74.24cm or 29.23inches. Sori :1.82cm or 0.72 inches. Width at the hamachi : 3.24cm or 1.28 inches. 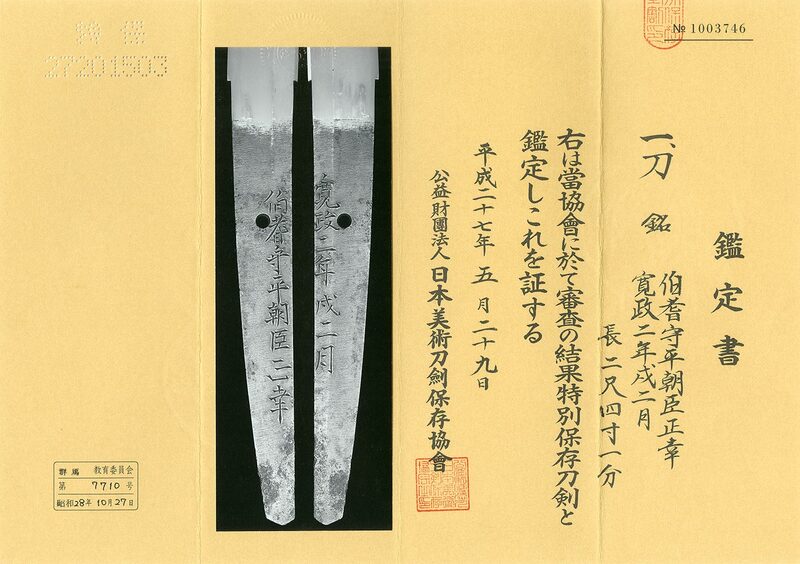 Width at the Kissaki : 2.42cm or 0.95 inches. Kasane : 0.69cm or 0.27 inches. with deep sori and oo kissaki style gorgeous blade. Jigane :Itame hada well grained with jinie attach blackish with chikei work. Hamon :Nie deki notare and togari ba with thick nioikuchi. In Hamon, sunagashi, Kinsuji, Yubashiri work. Special feature:He was a swordsmith of Satsuma province, present Kagoshima prefecture, and followed Miyahara Masachika school. He changed his signature to ‘Hoki no kami Ason Masayuki’ at Kansei 1st (1789). He was well known as ‘Masayuki’ and worked actively Kansei era. ‘Masayoshi’ was his first signature and this work was made when he was only 22 years old. This sword has Itame-hada well grained and Masame-hada mixed with long Chikei work. Hamon is active deep Nioikuchi blackish Jigane which is typical Motohira and Masayuki. Both of them are top ranking swordsmiths at Shinshinto era in Satsuma province. and also active wild feeling temper line. Tsuba :On the mokko style iron tsuba, wave motifs are engraved. Menuki : Flower design is engraved in solid gold and silber color. kiri family crests are engraved with gold color. From Aoi Art: Shinshinto Hoki Kami Masayuki and Motohira both sword makers are right and left wing top ranking sword makers shinto Jyo Jyo saku ranking. The blade is almost same work like active notare gunome midare with chikei and inside of the Hamon are working sunagashi kinsuji and also yubashiri. I think both sword makers tried to make Shizu, Masamune utsushi. like Shizu, Masamune and so on. This sword is very long, wide and thick with deep sori and ookissaki gorgeous sword. Back ground of age: Syaraku is famous woodblock printer worked active about 10 months but disappeared suddenly.